As is true for most government officials, Georgia’s Whitfield County Tax Commissioner Danny Sane is under constant pressure from his constituency to keep costs under control. In an era of downsizing, Sane’s management style, reliant on innovation, has allowed him to maintain the same head count he inherited two decades ago. He’s also been able to cut operational costs by more than 63 percent. The office of the Whitfield County Tax Commissioner is responsible for processing about 400 car tags per day and collecting property taxes on 50,000 parcels of land for the city, county and state. “Predominantly we deal with checks, and that is a huge concern, so it’s very, very important we can process them promptly,” Sane says. During busy times, the office processes between 150 to 200 checks per day and that number can jump to 600 checks per day during property tax season. Initially, the task of processing checks and preparing the deposit was handled manually, taking two employees nearly five hours each day. It is difficult to keep costs low by processing manually, so Sane sought a new solution to automate the process. 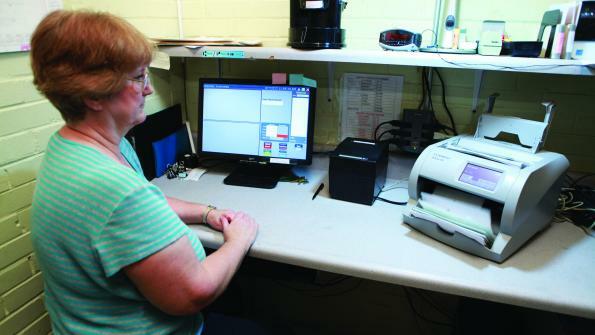 He found the JetScan iFX check and currency scanner with Deposit Balancing Manager from Cummins Allison. “Going from manual calculating [the system] is saving us hours per day. I’m able to not only do the tag deposit, but also the tax deposit, and I can get both of those done in the amount of time it would take me to get just the tag deposit done,” Sane says. In addition to checks, Sane’s office also takes in cash for payments. The scanning system enables the department to process both checks and currency on a single device, eliminating the need to invest in additional technology, while saving space. Most importantly, Sane says the innovation has helped overcome the monumental task of decreasing operational costs, while maintaining staff levels. 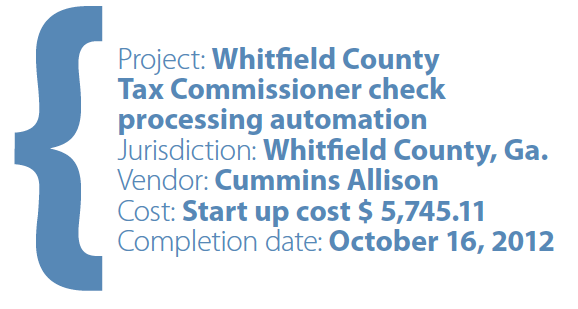 By investing in various technologies, the Whitfield County Tax Commissioner has been able to reduce net operational costs from $475,000 20 years ago to $175,000 today. Sane stresses that streamlining operations doesn’t eliminate jobs, it simply makes the current jobs more efficient, and public servants can do more for their constituency with the current office staff. Sane says that his story is not unique to his county alone. Because checks are the most-used form of payment, other government agencies can follow in Whitfield County’s footsteps and see the benefits of making their department more efficient through innovative, cost-effective technologies.